If you’ve recently started prepping, one of the first things you’ve probably noticed is how expensive it is. From stockpiling ammo to food to gear to medicine to water and so on, the cost of getting ready for a disaster can add up really fast. This is why budget prepping has become such a popular topic. Some preppers spend hundreds if not thousands of dollars per month on prepping. Unfortunately, most people don’t have this kind of money or don’t want to spend it even when they do. The good news is that you don’t have to be rich to prepare for a major disaster. In fact, there are several ways you can prep without spending any money at all. If you have any old juice, milk, or soda bottles, don’t throw them away! Instead, use those bottles to store tap water. Simply rinse them out completely and then fill them up with tap water. You can ensure they stay safe to drink over the long term by either using water purification tablets or bleach (eight drops a gallon, or one drop a bottle, is the general rule). Always store your water in a cool and dim location out of the sunlight, and rotate it out once every year at the maximum (once every six months is safer). Who says you have to spend money on maps? In fact, why spend money on maps when you can just print them out at your house? Find some high-quality maps of your local area and any areas you might travel to when bugging out, and start printing. If possible, print both road maps and topographical maps. One of the most overlooked aspects of prepping is exercise. You need to be in top physical shape for when the going gets tough, especially if you need to bug out over a mountain with a heavy backpack over your shoulders (and over long distances). Not being in good shape during a disaster will be a big problem, but working out regularly will increase your odds of survival. Many survival sites (like this one) offer a free eBook you can download if you subscribe to their newsletter. Survival eBooks can be rich with information, not to mention they make a perfect read for a rainy day. In addition, if you are a member of Amazon Prime, you’ll have access multiple Kindle eBooks for free that are normally $0.99 or more. You’re limited to ten eBooks on your Kindle device at once, but that’s still a great deal. Every day you should check your local Craigslist to see if there’s anything people are giving away for free. Typically, they will set it by the road and announce that whoever wants it can have it. Oftentimes you can get firewood, free bricks, and free boards which you could use to build storage shelves or repair your home after a storm. I’ve found several free things given away by people too lazy to have a yard sale. You just have to check it every day and be patient. An even better (but lesser known) site you should visit is Freecycle.org. Unlike Craiglist, which is mostly people trying to sell stuff, Freecycle is focused on free stuff. It’s made up of thousands of groups where you can post things you’re looking for or things you want to give away. Finally, be sure to check out CouponMom.com. If you check it on a regular basis, you can often find coupons for free samples. This is going to make me sound like a real cheapskate, but sometimes when I’m at a fast food restaurant, I take far more condiments, napkins, and straws than I actually need. Not so much to be conspicuous, but enough so that I don’t have to buy these things at the store very often. Over the years, I have collected pouches of ketchup, mustard, mayonnaise, hot sauce, barbecue sauce, salad dressing, salt and pepper, and all sorts of other things. I also have a huge supply of napkins, straws, plastic utensils, and extra cups. Sure, it’s a moral gray area, but countless times the employees have seen me taking these things and they’ve never said a word. Like I said, just don’t take too much at a time. The same rule applies when you stay at a hotel. Take as many amenities as you’re allowed. Soap, shampoo, conditioner, toothpaste, toilet paper, coffee and creamer, bottled water (make sure it’s free before you take it so you don’t have an extra charge on your credit card). As we mentioned in our article about 5-gallon buckets, you can often get them for free at restaurants, grocery stores, coffee shops, and other places that sell fresh food. There are many free survival-related apps available to download on your iPhone or Android device. 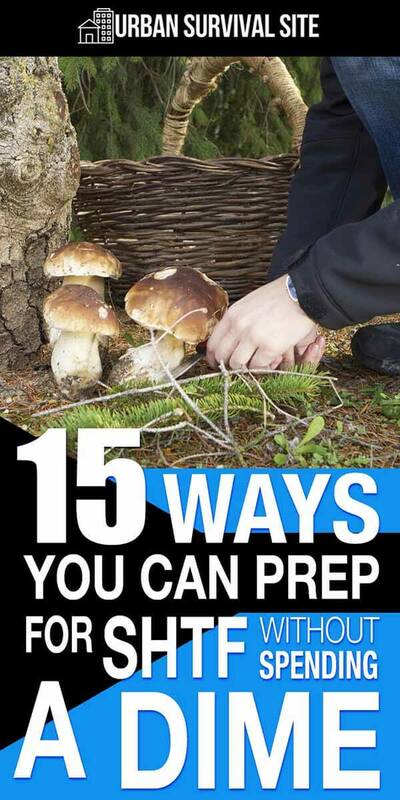 There are countless apps that teach you survival skills such as first aid, starting fires, building shelters, and finding wild edibles with full-color pictures and step-by-step instructions and illustrations. Many people find it easier to learn from these apps than from reading books. There are also apps that will alert you when a disaster has occurred, or let you alert authorites if you’re in danger. Here are a few apps that could save your life, and here are some apps with survival uses. Do you want to know what doesn’t cost any money at all? Practice. And a couple things that take a lot of practice to master are building fires and building shelters. These are very important skills to have. Seriously, you NEVER want a true life-or-death situation to be the first time you have to create a fire or construct a shelter. This weekend, head out into the woods and build a roaring campfire. While you’re at it, build a survival shelter. Make it an event. Bring some friends or your family along with some food and drinks and enjoy yourself. Then, if the day comes when find yourself in a life-or-death situation, you’ll already know how to do these things. Even if you’re not a prepper yet, you should be able to find enough items lying around your house for you to make an emergency kit. If you don’t have one, start by making a kit for your car. The reason a survival kit is necessary for your car is so you’ll be prepared if you blow a tire or your engine stalls while you’re in the middle of the desert or stuck in a blizzard. This one is fun. You can hide a cache of basic survival items in a strategic location that will allow you to resupply yourself should you need to evacuate your home. Pelican cases, PVC pipes, and metal ammo cans are the three best containers to use for caches because they are waterproof and can be buried underground without the threat of the inside items becoming ruined from moisture. Out of those options, the metal ammo can is the cheapest and the easiest. Simply fill up your container with your desired items and then seal it shut. Be extremely selective about where you choose to bury it, as you want it to be in a location you will pass by while bugging out (such as en route to your rendezvous or bug out location). For more information, check out this article. There are all sorts of things preppers shouldn’t throw away such as dryer lint (fire starter), coffee cans (for survival kits), glass jars (for storing food), newspapers (for making firebricks), tin cans (for making stoves), plastic bigs (for cordage, organizing supplies, etc. ), and so forth. By upcycling these items, you will save money, get more prepared, and reduce your carbon footprint. What’s not to like? Knowing what’s in your area and where to find it could be incredibly useful knowledge later on. For example, if you’re incredibly hungry, you could keep your eyes peeled for local wild edibles that other people are likely to pass. You could also keep your eyes peeled for medicinal herbs in case medications such as painkillers are in short supply. Rather than let leftover meat and vegetables go to waste, can it! Simply put the meat and vegetables into canning jars and then pressure can it. Proceed to store the cans in your cupboard and it will be ready to eat when you need it. Hamburger meat, roast, sausage, chili, and so on are all examples of meals that can be canned and saved for for the future. If you’re new to canning, here are some things you should know. Countless books and articles have been written on DIY survival hacks and projects for you to peruse. Pick a few of those projects to apply in your own life. Basically, a DIY (Do-It-Yourself) project means that you find random items lying around your house and then repurpose those items for survival and disaster preparedness. Turn bricks and cans into camp stoves. Turn cinder blocks into all sorts of things. Make a torch with cotton, vaseline, and a drinking straw. Make a Faraday cage out of aluminum foil, a T-shirt, plastic wrap, a coardboard box, and packing tape. The list goes on and on..
Not only are DIY projects fun to do, they also teach you to be more resourceful and to see renewed value in the ordinary items around you. You’ll never throw anything away again without thinking twice about it. Finally, here’s something that’s very important and that should be done no matter what: crafting a family emergency preparedness plan. On most days, your family is separated. You and your spouse or partner are at your different jobs, and your kids are in school. Have you ever asked yourself how you would get together should disaster strike while you are all separated? Your rendezvous point where you will all meet up in town. Your primary and secondary routes for getting to your rendezvous point from school/workplaces and then to home. Emergency contact cards that your kids keep at all times. After you write up your plan, practice it. Actually, walk or drive the routes you set until you have them memorized by heart. If this article has taught you anything, it’s that you don’t need to be rich in order to prep. In fact, you can be on an extremely limited budget (or no budget at all) and still take important steps to become prepared for the next societal catastrophe lurking right around the corner. Thanks for reading! Don’t forget to pin this article. Do not use milk jugs to store water in for a couple of reasons 1) you can never truly get all the mike residue out of the plastic and the water will become foul, 2) these type of plastic jugs are meant to break down quickly. Just rotate your stored water when the time change for daylight savings happens. I use the stored water in my washing machine so it does not just go to waste. Look for free wood and pallets at factures. Just remember that many pallets are made of treated wood and you should not burn them. I have picked up a lot of good rough sawed pieces of wood from places that are being in new equipment.